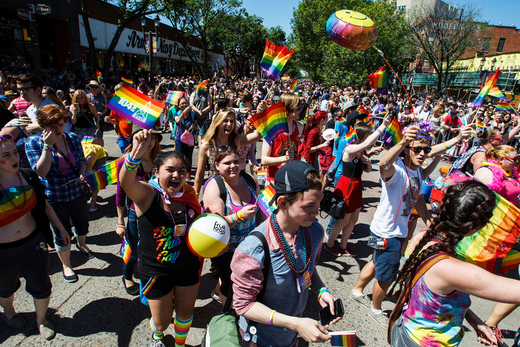 Strathcona County and The altView Foundation have teamed up to provide free transportation for EIPS students who want to watch or join Edmonton’s Pride Festival on June 9th! Our focus is on giving youth in our schools the opportunity to come together and take part in the celebration of LGBTQ2S+ people in our communities. Students who are interested can register for one of two buses. The first (link to registration page) will leave from The Community Centre at 7:30am and will be the bus for anyone interested in being a part of altView’s parade entry. Our theme this year is Full Spectrum Pride and to show that, we’re asking that any GSA that comes with us does one simple thing: everyone from that group should wear coordinating colors. Be it a color the club thinks best represents them, or their school colors! Our entry will look like a wonderful rainbow representing all the supportive schools in our community. The second bus (link to registration page) will leave The Community Centre at 10am and will transport folks to the parade route to give them the amazing opportunity to watch the Pride Parade! We strongly recommend folks who join us (either as a participant or a spectator) wear sunscreen. The weather last year was drizzly, but hopefully it’ll be sunnier this year. If anyone has any questions, please don’t hesitate to ask (email us at info@altview.ca). Hope to see your clubs represented!! Please share this with your students who may be interested!